Try Password Lock, an interesting application to store safely and manage your passwords. The application is written in Java and therefore works on most operating systems (Linux, Windows e MacOsX), is free and there is also an app for Android devices. 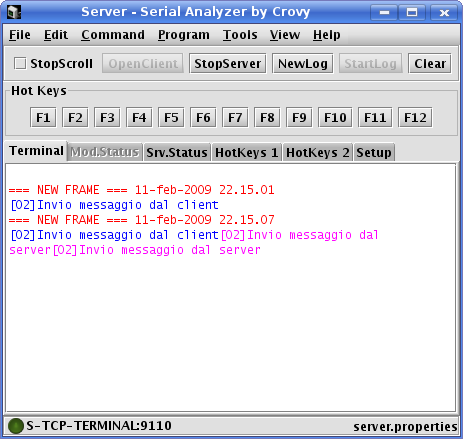 Serial Analyzer is a software Born in 2001 to monitor the data exchanged by the two equipment on the serial line. Time has evolved integrating connections tcp/ip client and Server addition to recall BeanShell scripts useful to compose real programs or simply calculate the checksum frame to be transmitted. This software, due to the driver to handle the serial line, can run only on Windows, Linux and MacOsX operating systems. Server Tcp/Ip or Udp function, from the list of connected clients you can exclude a communication with a specific clients by using a check box. BRIDGE, like manner ECHO with ab option to make also a client connection. In this mode you can make a bridge between a Tcp/Ip server and a serial connection. Interfacing with BeanShell that allows you to create real Java programs to be executed from "HotKeys" or special menus. For the Serial Analyzer has been made a special installation program valid for both Windows, Linux and experimental for MacOsX. Just extract from the zip and run it. For installation need to be "Administrator" of the system because drivers for serial lines are installed in Java folder that generally can be found in sections accessible only to (root) Administrator. This you see is an example of client tcp/ip connection. This you see is an example of server tcp/ip connection. For this program there is a italian and english manual (that is integrated in the program). Requires J2SE 7.0 (version 1.7) or higher, are not supported versions below. Download the Serial Analyzer 2.8.0 installer. If you have a problem to manage the usb to serial converter under Linux, you can view our tutorial dedicated to the usb to serial converter! Since version 2.7.0 Serial Analyzer uses the librariesRXTX which operate automatically (ie without creating a link) the usb-serial converters, of course, the operating system must always operate such converters at the driver level. From the programming editor, by double clicking on a line with the "send" or "command mode"instruction, the string is automatically transmitted on the open connection channel. Added the ability to load from the command line the .properties file and the .sap file. They do not need parameters, just specify the full path and file name (with extension) of the files to upload. Modified log file management. Now every time you start the log, you must select where to save the log file itself (it is proposed automatically on the last file used). Replaced the old and no longer supported libraries JavaComm with libraries RXTX. 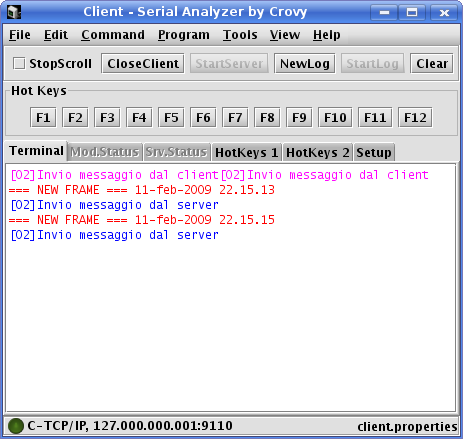 This allows you to use the Serial Analyzer even on Apple computers with Mac OS X (only x86 no ppc). Modified the definition and management of FrameHeader and FrameTail so you can write directly in ASCII characters (first you have to use the decimal/hexadecimal encoding used in SerialAnalyzer) and of indefinite length (the first was limited to 10 characters). Fixed bug: could happen that at the start of the program the window size was larger than the default or even larger than the screen blocking the same program. The error appeared in the presence of a large amount of text assigned to a function key and saved in the default properties file or in the file specified on the command line. Fixed bug in management of RUN led. In the event of a program that calls a script. The led remains off. Fixed bug saving management of configuration and program when you close the Serial Analyzer. If you enter int the file save dialog and than abort the Serial Analyzer is closed. Added option to not interpret the decimal encoding in the data sent. Useful when data in XML format. Added "Line Mode" option to send data only after pressing the Enter key. Useful for sending AT commands to the modem, so you can correct the string with the backspace key. It works only for data entered by keyboard. Added command to send the "break" signal on the serial line. Fixed error in the management of the minimum dimensions of the main window. This did not allow the proper scaling, for example, when it decided not to see the edges or the StatusBar. Fixed error on opening the client connection from a script in BeanShell. In practice, the connection was opened but were not handled the data sent and received. Fixed error in interpretation of coding data encoded in decimal and hexadecimal. The string "<abc>" was always interpreted as decimal encoded data and the string was not transmitted. Obviously the string "<065>" is always converted to "A". The same error was also present for the hexadecimal encoding, the string "[1K]" was not transmitted. Added serial line BaudRate selection of speeds 230400, 460800 and 921600 (attention, not all systems support these BaudRate). Added display messages in the Terminal Area when changing the state of control signals of the modem. This messages are recorded also in the log file. Added option to display system messages in the Terminal Area (actually only the control signals of the modem). Made available to scripts in BeanShell method "getApplicationDataString". Added in View menu an option to select the LookAndFeel to be applied to the program. The LookAndFeel is managed by the JcLafChooser program used as a library. To add more LookAndFeel see the instructions for the JcLafChooser. Correct error in the method intToString available to BeanShell script. The method converts the integer data into ascii string compliant to the selected view format of the SerialAnalyzer parameters, instead of always convert to the format CTRL -->HEX. When you run a script in BeanShell I check if the option "AutoAnswer" is active, if it is active will be asked if you want to disable. Fixed error in the "Program" section. The maximum size of a package udp was set in 2048 byte whereas worldwide parameter Maximum Transmission Unit (MTU)	is set at 1500 bytes. For info view Wikipedia. In the table "Server Status" are recorded all udp connections, udp packets are sent to all clients who are connected. To delete a client select the check box "Exclude" and at the first transmission this client is removed from the list. Completely rewrited management recognition of Frame Header. Fixed error in writing to the log file when they recognize from two different Frame Header with different length that caused an exception. Fixed error management keyboard when you write directly in the terminal area were not accepted the characters typed in combination with the "Alt Gr" key (such as @ and # in Italian keyboard). Fixed error that occurs when the Java Virtual Machine is updated. In previous versions the Serial Analyzer not started and no errors was reported. Now an error message is shown indicating how to resolve the problem. This happens because when you install the Serial Analyzer the libraries for managing serial connection will be installed in Java Virtual Machine used at that time, when installing a new Java Virtual Machine these libraries are not present. To resolve this problem we must start the installation program of Serial Analyzer and select to install only the "Library System". In previous versions, to see if the problem is the same, you can start the SerialAnalyzer from shell/dos with the command "java -jar SerialAnalyzer.jar" if you see the following exception: "Exception in thread "main" java.lang.NoClassDefFoundError: javax/comm/CommPortIdentifier" the problem is the same. Added menu "View" with the commands to select which components view and enable the visualization of the transmitted data. By default, all entries are enabled and consequently all the components are displayed. If you want to reduce the minimum size of the program window you can choose to disable the display of some component. The only exception, if the vertical resolution of the display is less than 480 pixel edges of the buttons are disabled by default. In programming mode was changed the minimum time set for instructions setSleep and wait from 100 to 10mS.